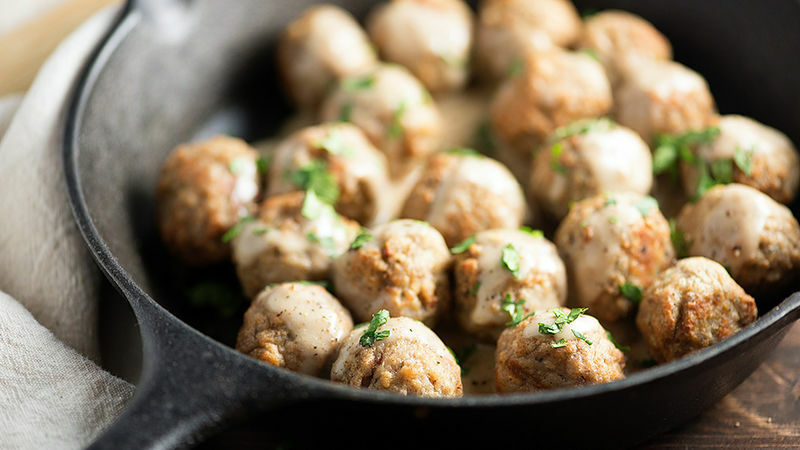 Toss frozen meatballs with allspice and place on rimmed baking sheet. Cook meatballs in oven according to package directions. While meatballs are cooking, prepare gravy. Melt butter in a small saucepan over medium heat. Whisk in flour and cook for 1 minute, stirring constantly. Whisk in beef broth and continue cooking, whisking constantly, until thickened, about 5 minutes. Remove from heat and stir in sour cream. Spoon gravy over cooked meatballs and top with parsley. Serve with mashed potatoes and lingonberry jam for an authentic experience!